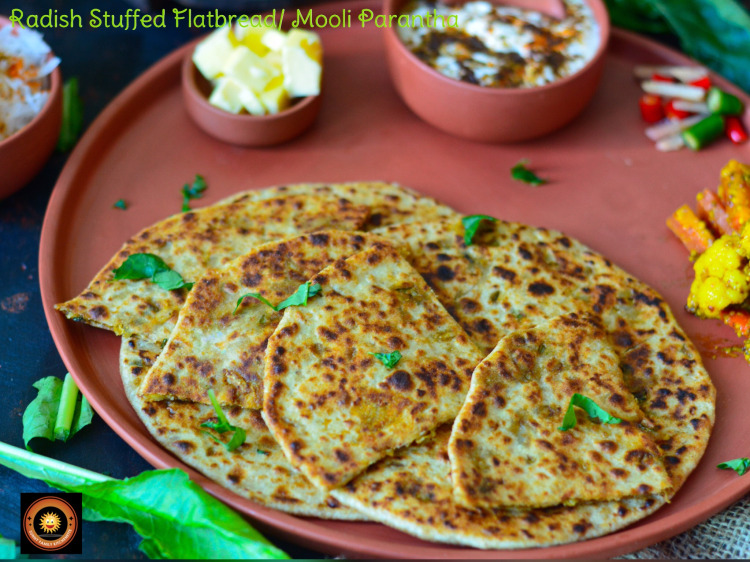 Paranthas or shallow fried flatbreads are a must have in every North Indian household each and every morning. To bring in something new each day it is made with lot many twists. It won’t be an exaggeration if I say that you can have ‘NEW DAY NEW PARATHA’!!! 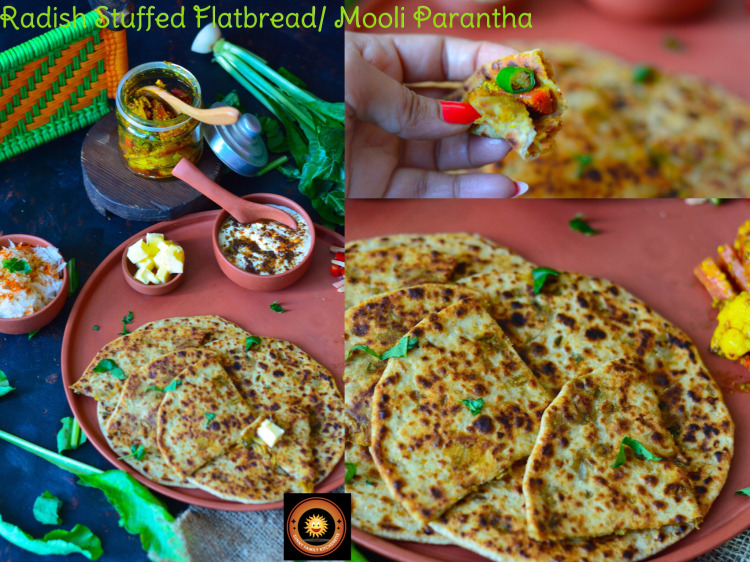 There is no limitation to what kind of stuffed paratha one can prepare. Any recipe is just a guideline. 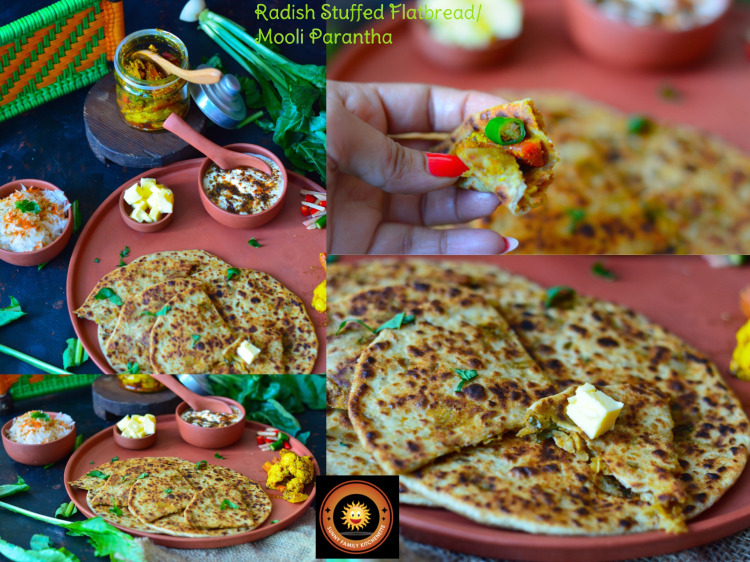 Imagine any vegetable, turn it into a stuffing along with some basic spices from your spice box and voila a new kind of paratha is there on your plate!!! 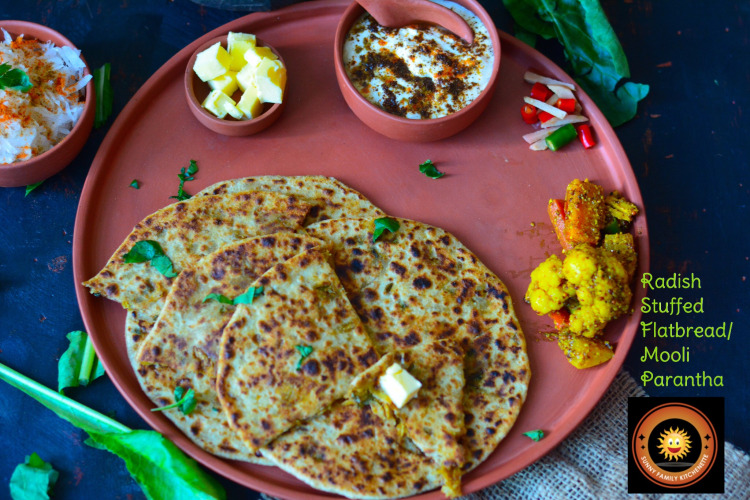 Parathas can be eaten as a breakfast dish or a brunch kind of meal, and are perfect as a tiffin snack. 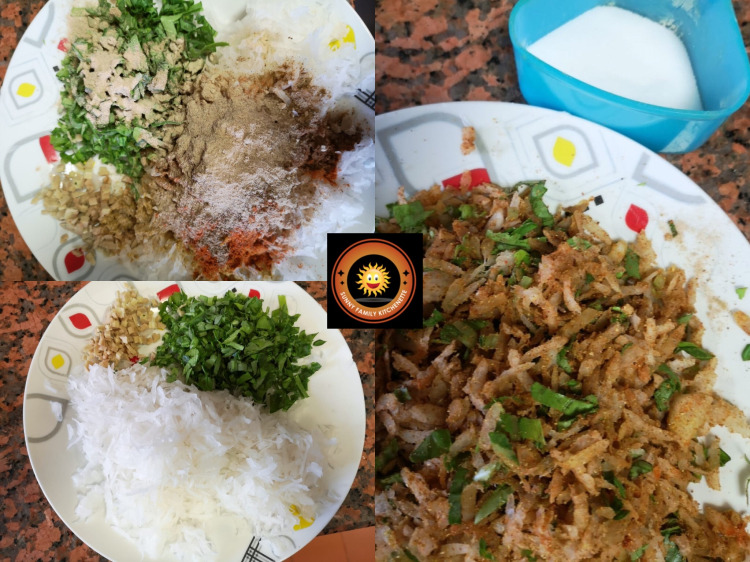 The flour used is finely ground wholemeal (atta) and the dough is shallow fried either using clarified butter/ ghee or oil. Some people may even bake it in the oven for health reasons. 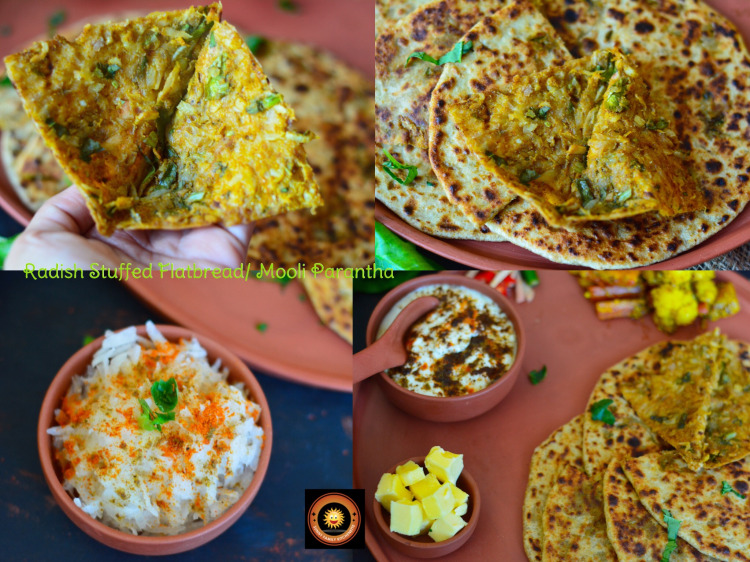 This recipe of Radish parantha or Mooli parantha is an absolutely wintery delight. Radishes give the parantha a very unique and pungent flavor. I love eating mooli parantha with pickle and curd. 1-The dough should neither be too soft nor too firm. It should be semi firm. If the dough is too soft, makes it difficult to roll the paratha and if it’s too firm the stuffing will not set properly in the paratha. 2-The stuffing should not be watery. There should not be any moisture in the stuffing. Make sure to use dry ingredients as stuffing. And also add in the salt just before you are ready to roll out the parathas. 3-When you put the stuffing inside the rolled out ball, make sure to seal the edges well. Otherwise the filling might spill out. 4-Cook on a medium high flame. This way you will have crispy parathas. 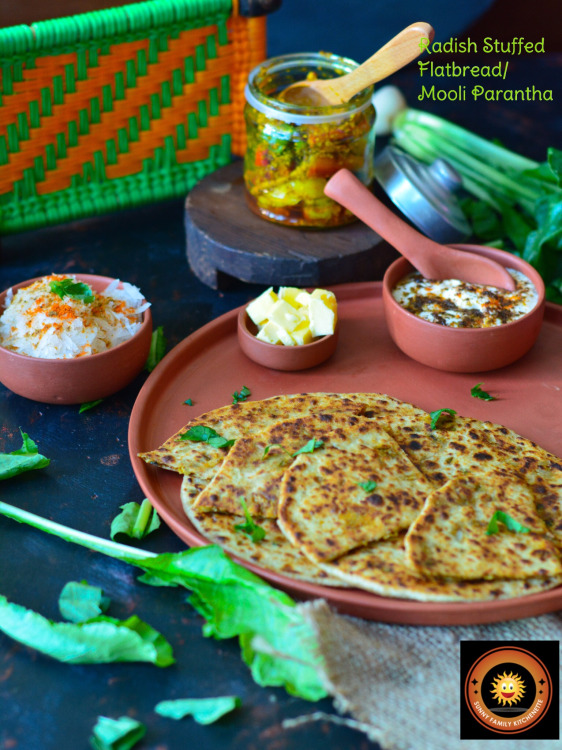 I guess now we are ready to dig into the scrumptious world of Parathas;) Let’s check how to make them. We will start by making the dough. For that put flour and salt in a bowl. Start binding the flour with the help of water. Make a semi stiff dough. Cover and keep aside. Meanwhile we will prepare the radishes for the stuffing. For that, grate the radishes with the help of a grater. Squeeze the juice out of radishes as much as you can. There should be no moisture content in the radishes otherwise it will be difficult to roll the paranthas. Add all the masala powders in the radishes except salt. Divide the stuffing mix in 6 equal portions. After that, give your dough a quick knead again. Divide it into 6 portions. Roll each portion into a ball. Dust the counter with some dry flour. Take one dough ball. With the help of a rolling pin and dusted dry flour on counter top roll out each portion into a (3") diameter circle. Take one portion of stuffing and add salt to it. 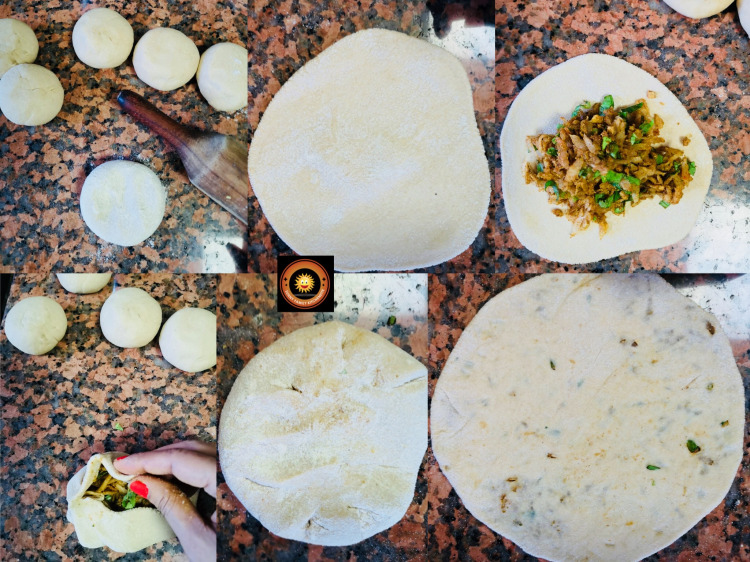 Next, put that portion of stuffing in the centre of the rolled dough. Roll again into a circle of about 6 inches diameter with the help of dry flour for rolling. Heat a non-stick tava (griddle) and place the rolled out parantha on it. Cook on one side for few seconds. Flip it over. Cook on other side too for few seconds. Apply some oil or ghee on top and flip again. Press gently with the help of a spatula. Cook till it turns golden brown in colour. Flip again and cook on other side too. 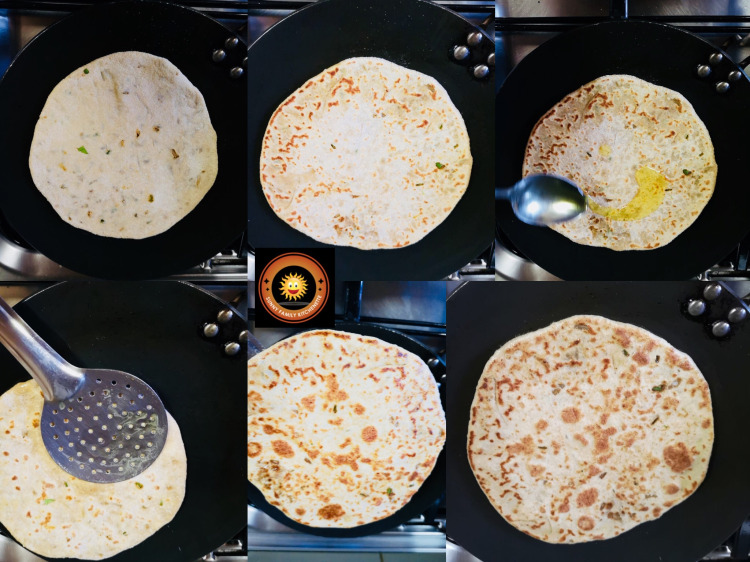 Cook the paratha until golden brown spots appear on both the sides. Repeat the same process with the remaining dough and stuffing to make more parathas. Serve hot with fresh curd, raita, pickle or butter.